Ciders » Pommies Cider » Our Ciders » Pommies Cider Co.
Pommies ciders are crafted from the juice of 100% Ontario apples and pears, and made at our cidery in Caledon, Ontario. Pommies Original (5% alc.) is a classic, Ontario style semi-sweet cider. Made from the fresh pressed juice of five varieties of Ontario apples, Pommies Original is clean, crisp and refreshing. 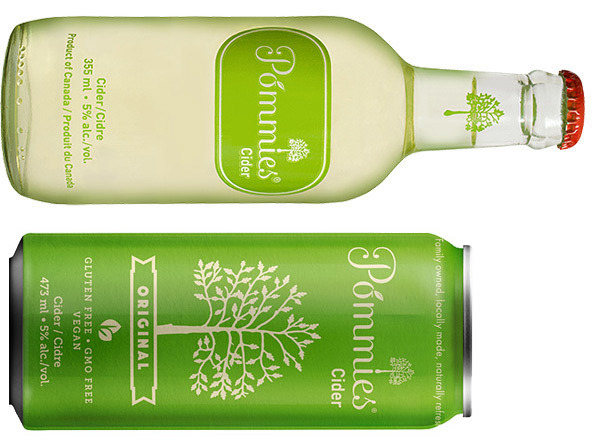 Pommies Original is a light-bodied, easy-drinking cider with a balanced finish. Pommies Farmhouse (6% alc.) is a traditional cider that appeals to a sophisticated palate. Made with fresh pressed juice of Ontario apples, Farmhouse is dry, medium-bodied and complex. It is a crisp tangy cider, rustic in nature and refreshing to the core. Pommies Farmhouse is richly carbonated with a fresh apple aroma and a dry finish. Pommies Red Sangria (6.3% alc.) is a refreshing blend of Ontario cider and wine, spiked with splashes of citrus and berries. Deep red and cloudy, our cider sangria is a fruit forward, semi-sweet patio classic with an apple twist. Pommies Perry (5% alc.) is a semi-dry pear cider with floral notes and spicy undertones. Made from the fresh pressed blend of Ontario Bartlett and Bosc pears, Pommies Perry is gently carbonated and smooth, and showcases the natural sweetness of the pears. Pommies Cranberry (5.5% alc.) is a fruit forward, slightly sweet but refreshingly tart red cider. We blend the fresh pressed juice of Ontario apples and cranberries before fermentation and infuse with cinnamon and nutmeg for a balanced, sophisticated quencher.